So the big job this winter is an engine re-build and I am starting to think about looking for recommendations of someone to trust my engine to. I am capable of the strip and the re-build myself but do not have the experience to know what is worn so I think it needs to go to a professional. I make no apologies when I say I am anxious about this. The car has been in the family since 1973 (it’s a 1970 car) so it’s provenance is known. The head has never been off and it will have done (after RBCD) 74,000 miles. So she is due some TLC. As expected she is a bit noisy on the top - but still goes really well. Leaky too these days. Carbs were completely refurbished professionally in 1990 and the car has done about 10,000 miles since then (it is getting a lot more use recently). So whilst I want them stripped and sorted I don’t expect they need too much work. Would want the gearbox done too obviously. Basically everything to refurbish or replace to put it back together for a good few years. I want to deliver the engine and gearbox unit complete but out of the car so I can spend the winter refurbishing the engine bay and all components. So who should I trust my beloved unit to? I don’t want any performance upgrades just someone to do a professional job and give me back an engine for another 74,000 miles. As always, I value the feedback here. That’s a very good point Geoff. Thanks for the prompt. I should have said I will be prepared to transport it anywhere in the UK for the right job. I would stick it on a pallet (UK Palletline) and have it all moved down to me in Lincolnshire..
John Everard is the man, budget £7k for the engine and box I would think. PM me if you would like his phone number. Ash there is a place up North of you Kinkell Classics. They do the XK engine since 30 years. 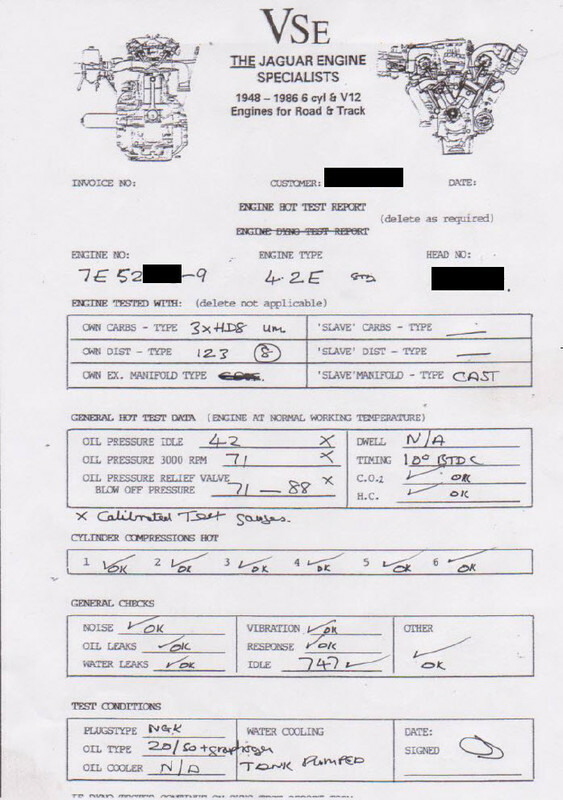 My engine is perfect it comes with a engine test report and ready to fit. Not impressed with putting a S2 block and more particularly a S2 manifold into a S1 E-type. Clearly little concern about originality even though a new block may be nice. Last edited by christopher storey on Fri Aug 24, 2018 5:54 pm, edited 1 time in total. I believe the differences in inlet manifolds are between the 3.8 & 4.2, so not necessary wrong if they’re building a S1 4.2. The people Angus uses have a good reputation and warrant their work. Send him a PM to get the details. for engine work speak to Chessman engineering. They have an excellent reputation and are used by a lot of the trade. I have no association with this company just good experiences. 2. Tom Barclay - Buckinghamshire - who is a trainee/protégé of Rob's and has his own XK engine/ E Type business. He's now doing the engines for Jaguar Classics. At Rob's request he dropped what he was doing to fix my leak today. (rear oil gallery plug not sealing properly...extremely hard to get at, but he managed, don't ask me how). And he's cleaning up the oil mess underneath. At Rob's cost. So that's 2 firms I put right up there in the A* category. Happy to give more details if you PM me. Thanks to all for the feedback. Always very much appreciated. I plan to get on the phone on Friday and speak to all of the recommendations. You might wish to pm him before making a decision. Hi - I can’t help with this thread but I am trying to track down John Everard at Boston to rebuild my late grandfathers ‘34 Riley engine. I’d be grateful if you could direct message me, or email me at matthew.robertson@wiverton.com. Yes of course, I have sent you an email. He is full of beans, saw him on Friday.